U.S. Sen. Robert Menendez has been “severely admonished” by the Senate Ethics Committee for accepting friend and campaign donor, Dr. Salomon Melgen. The Jersey City Council adopted new rules for home demolitions. Plus, one person was taken into custody in connection to an online shooting threat that caused a Jersey City high school to go under lockdown. See what Bayonne’s Second Ward candidates say about the key issues in their part of the city leading up to the May 8 election. In Sports, St. Peter’s Prep alum Minkah Fitzpatrick was picked by the Miami Dolphins in the first round of the NFL Draft. 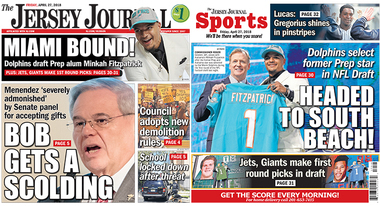 Plus, Jets and Giants made their picks.